A visit to Brisbane is incomplete if you don’t go to the Gold Coast. Weekend before, we drove to Sunshine Coast – north of Brisbane. And this time, we headed south to one of Australia’s most popular destinations: Gold Coast. Just as the past weekend, we rented a car as we took two days of the weekend to explore both the hinterlands as well as the beaches. We didn’t go to any of the fancy and expensive theme parks. Some of you may argue that we were crazy to give the theme parks a skip but to me there’s nothing that we really missed. The reasons why we didn’t go to theme parks were the exchange rates were not in our favor. That resulted the fees could be very expensive. Also J and K are still not suitable for the “extreme” rides. 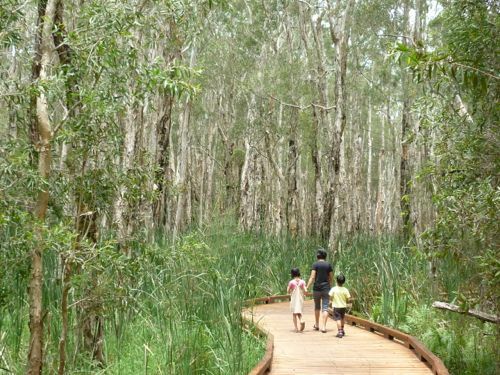 Anyway, without theme parks, there are still a lot to explore on the Gold Coast, as you will find out soon. Springbrook National Park covers a huge area. We had to decide where to go. Our main goal was to visit Natural Bridge first. 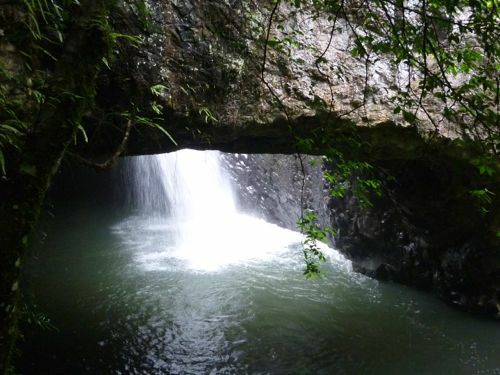 The Natural Bridge is a 20-30 minutes walk from car park. Just follow the well-laid track and you are fine. You’ll have the opportunity to view Natural Bridge from 3 different angles. Natural Bridge is an amazing formation by the force of nature. When we went, it was raining. Fortunately we were prepared and umbrellas came in handy. 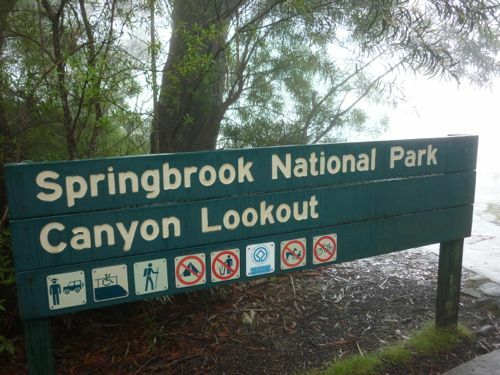 Directions: Natural Bridge of Springbrook National Park is 40 km away from Nerang Exit on Pacific Motorway (toll free). It is along Nerang-Murwillumbah Road. You go through some winding and narrow roads before reaching. Later, we went to another side of Springbrook National Park where there were a few lookouts for scenic places. When we were half way there, we stopped by at a roadside cafe for simple lunch. The coffee I had was the cheapest I had in Brisbane so far: $2.50. The rain had not stopped and our plan to view the scenery at various lookouts was not fruitful as it got very foggy and misty. We could see nothing. Not a good day to enjoy the views of the mountains and falls. Back to the motorway from Springbrook, we took a drive until the end at The Spit. It is a haven for fishing enthusiasts. And it’s a nice place to enjoy sea breeze and fresh air. Marine Mirage is the place too see lots of million dollars yachts and for shopping too. Sea World theme park was there but we didn’t go. We had a quick stop at Main Beach and there were many surfers there. We didn’t go to the beach. We took the coastal road to Surfers Paradise – going through Southport (from Nerang Street via Pacific Motorway). I was told the place was very crowded but it was okay the day I went there. Gold Coast (Surfers Paradise in particular) is kind of weird as you can see high rise buildings just next to the beach. We stopped our car on Laycock Street. I couldn’t find free parking in Surfers Paradise and the parking is $2.70 an hour. You can use coins or credit card to pay. If you pay cash, there’s no minimum payment but with credit you must pay $2.70 minimum. After spending 1.5 hours at the beach, J and K cleaned up at the showers provided along The Esplanade. And we went to have a walk along Caville Avenue – where most tourists go, shop, and dine. Finally we picked Hazel Tea House for our dinner. We had Chinese fried rice AUD$8.50, minced pork noodle $10. Fish ball noodle $8.50. 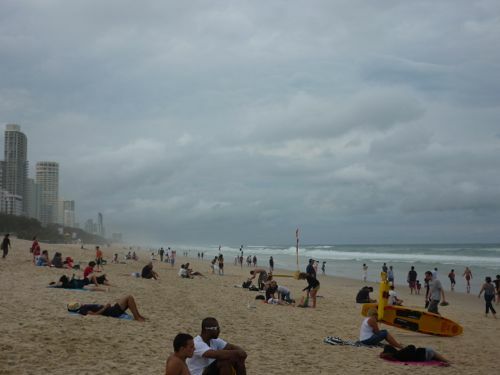 I don’t really like Surfers Paradise because it is very crowded and touristy. I don’t mean to sound impolite but one can see too many Asian tourists there. And the businesses are catered for them (Asian restaurants, souvenir shops, Asian grocery stores and others.) It’s not as “authentic” as Brisbane. And the worst is many people just smoke anywhere they like in Surfers Paradise. Unlike Brisbane where people there are more disciplined and it is rare you bump into a smoker in public (except smoking areas of course). That day we reached our apartment at 9.20pm. The distance from Surfers Paradise to Brisbane CBD is 1 hour’s drive. Tambourine Mountain has a small town with some historical buildings. I didn’t know until I went there the town was very popular among tourists. It was very crowded and it was really hard to find a parking spot. The Gallery has 2 rows of shops where the famous clock shop is located. As parking was limited, we didn’t stop there except for toilet break. We proceeded to Cedar Creek Falls which was about 15 minutes from town through a very winding road. The falls is suitable for family with young children as it only requires a 20-minute walk to see the falls. It’s a round trip and you can see the falls up close. It can get very hot and it’s advisable to bring your hat. Despite the remoteness of the town, Tambourine Mountain has more residents than I expected. There are many houses in Mt Tambourine and its surrounding areas. 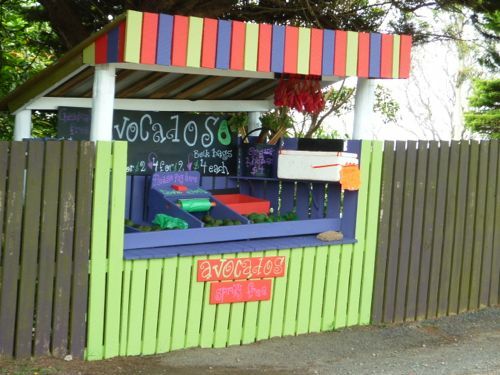 On the way down, we bought four avocados from an unmanned roadside stall for AUD$2. Dirt cheap and super fresh. They were the best avocados we ever bought in Brisbane. You can even eat it on its own. So yummy and creamy. 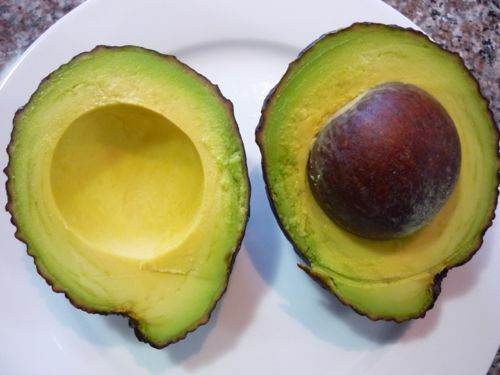 By the way, avocados have many health benefits and you should try to include them in your diet. Directions: From Pacific Motorway, take Exit 57 and proceed along Tambourine-Oxenford Road. It takes 40 km from the exit to reach. I like to find little-known places. 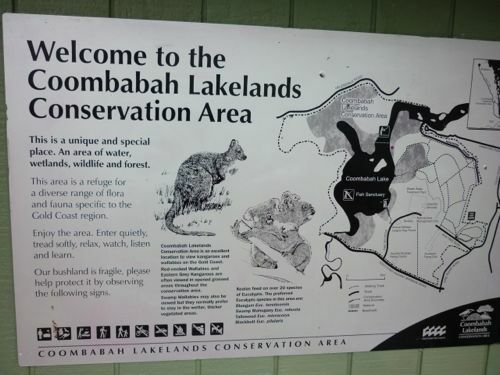 I got to know this place from a blog and Coombabah Lakelands is the best place to see closely the flora and fauna of a lake and its habitat. There is more than one entrance to the lake. We wanted to check out the boardwalk of the lake and the entrance is accessible via Rain Tree Glen. It’s not easy to find this place and it is not marked as tourist spot. We almost missed it. From Rain Tree Glen, you have to drive pass a gate which opens and closes automatically. Not far from the gate, you’ll see a sign (rather a map) on your right. That’s the entrance to the boardwalk. If you see a private airport, you have gone too far. Turn back. We finished the boardwalk and you will see different types of wetland plants and trees. But what we didn’t expect was the trip turned out to be one of the most exciting parts of our trip that day as we witnessed quite a number of wild kangaroos (or wallabies?) at Coombabah Lakelands. We had seen about 10 that day. And it’s interesting that the kangaroos were looking at you while you were looking at them. J and K were quite excited to find and spot wild kangaroos and try to get close to them. If you are not keen on the boardwalk and want to go direct checking out kangaroos on the loose, at the entrance, take the path on the left. You don’t need to walk deep into the forest to spot one as you can even see some kangaroos near the entrance. But beware, the mosquitoes there are as big as bees. Insect repellant is something you want to bring along if you go there. Directions: To get to Coombabah Lakelands boardwalk, from Pacific Motorway, exit from Halensvale South (Exit 62), keep left and turn left. After about 1-2 km, turn left into Pine Ridge Road and finally Rain Tree Glen on the left. We went to Labrador (which is not far from Coombabah Lake) for pelicans (giant pelicans which J and K said they were so unreal). And also to check out a seafood outlet a friend told us about. Charis Seafoods was crowded. The seafood outlet will cook for you on selected seafood (mainly fish) and for others, you need to buy raw). Tables and chairs are provided outdoor. 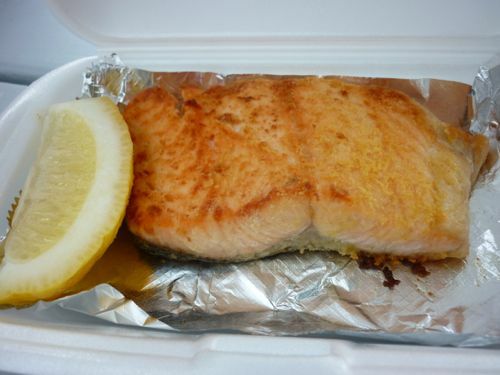 For lunch, we bought fish and chips (AUD$7.90) and grilled salmon AUD$9.90 (AUD$29.99/kg for raw while cooked AUD$39.99/kg) from Charis Seafoods. The seafood was fresh. J and K enjoyed the lunch very much. If you need to relieve yourself, the washroom is located at a side door of the restaurant. The giant pelicans can be found behind the seafood outlet. And they are not afraid of humans and some will try to grab your lunch. We later found out that one of the staff from Charis feeding the pelicans at about 1 pm. 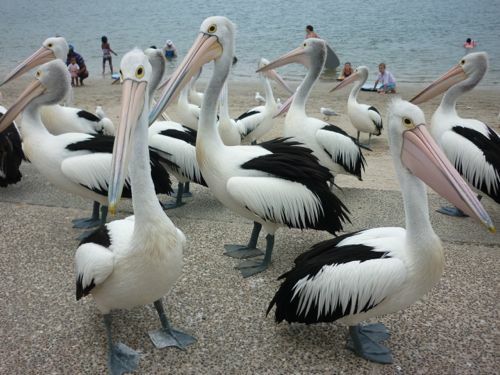 I guess that explained why the pelicans hung out there during lunch time. 371 Marine Parade, Harley Park, Labrador. 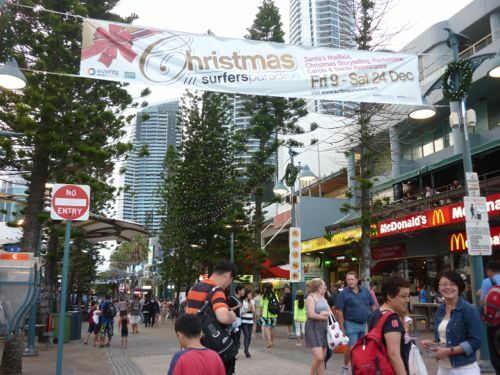 The biggest market on the Gold Coast with over 500 stalls and some are permanent structures. For some great bargains, here’s a tip for you. We went there at just about the right time (about Sunday 2.30 pm) – as we found out that – it was the time to get good bargains, especially on fresh produce. One of the stalls there was slashing prices like no other. For example, we bought a tray of Australian mangoes (my favorite) of 10 for $10. Stone fruits were reduced to $1.50/kg from $2.99. You can get really low prices if you go right before closing. Besides fruits and vegetables, you can find foodstuff, used books, T-shirts, souvenirs, plant nurseries, and even massage services there. When we were there, it was raining and we couldn’t walk around much except the stalls in the center. Carrara Markets is a nice place to shop with ample parking. The last stop in Gold Coast that day was… the beach. This time we wanted to try something far from Surfers Paradise. 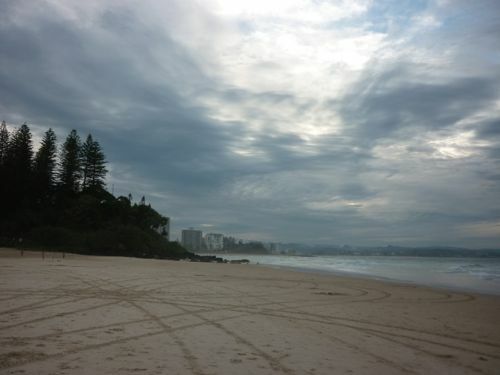 We traveled down the coastline starting from Broadbeach (Mermaid, Miami, etc) and all the way down to Coolangatta. The trip was well worth it as we spotted the best and most beautiful beach on the Gold Coast. And we were already planning for a second trip there! In Coolangatta we stopped at the park near Rainbow Bay. 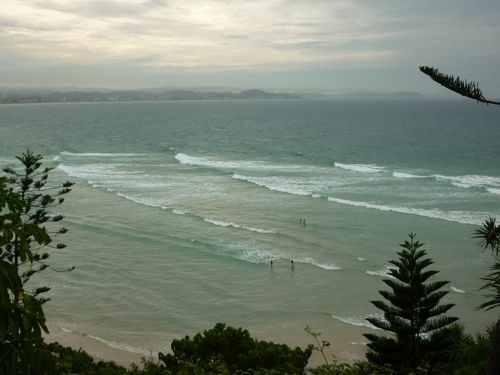 It’s a small hill and it overlooks Kirra Beach, Greenmount Beach, and you can see as far as Surfers Paradise. I must say the view is magnificent and breathtaking. Then we stopped by at Rainbow Bay. There’s a playground there but J and K didn’t play as the play equipment was wet that day due to rain. We stayed at the beach for quite a while and I prefer Rainbow Bay to Surfers Paradise as it’s not as crowded and touristy. Rainbow Bay is a hidden gem of Gold Coast and the beach is ideal for young children. My wife and I agreed that if we want to come to Gold Coast for a holiday again, this is the place to be. High on the ground, overlooking vast and blue ocean. What more do you ask for? Again, we had Hungry Jacks for dinner that night. With the help of GPS, we ended up at Hungry Jacks of Tweed Heads (it’s in New South Wales! Coolangatta of Queensland is bordering New South Wales) after going through some dark residential streets. We reached our apartment at 10 pm that night. Before that we went to Mount Coot-tha (which was unplanned for) to enjoy the night skyline of Brisbane. Despite it was 9 pm, the place was still abuzz with people and I didn’t expect it was so “happening” there. There is a cafe and a restaurant there. Mt Coot-tha can really offer a significant view of Brisbane with 3 viewing platforms of varying heights.